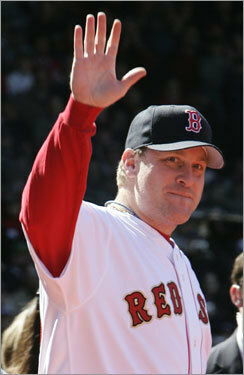 Curt Schilling said his goodbyes today, announcing he will end his outstanding 20-year major league career in which he established himself as one of the game's great clutch pitchers. Schilling, who was drafted by the Red Sox in 1986 but traded as a minor leaguer to Baltimore, made his debut in 1988 and played for four teams before arriving in Boston in 2004. He pitched for two championship teams during his four years with the Sox. The six-time All-Star compiled a 216-146 record with a 3.46 ERA. We look back at Schilling's memorable moments in Boston . . .